Pets are wonderful creatures to have around, especially when they bring some much needed joy and peace at the end of the work day. There is nothing quite like returning home to find Fido wagging its tail vigorously, as though your arrival back home is the only thing on its mind (and chances are, it is!). Well, while many of us would love to be able to bring about our pets with us wherever we go, even on long haul holidays, that is simply not possible unless you’re a super rich mogul with the means to do so. Leaving them alone at home without anyone else around is also not an option, as there is poop to clean and of course, feeding times to worry about. 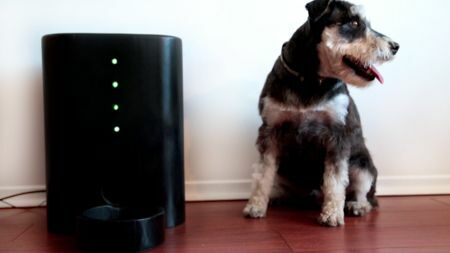 Enter this Kickstarter project that is known as Nibbles, a smart pet feeder with an integrated camera which allows you to feed and watch your pet from your smartphone, from anywhere at anytime! Nibbles will let you check up on your pet with the built-in front view camera of Nibbles, where a Personal Feeding Schedule allows you to figure out an unlimited amount of schedules to feed your pet. There is also a Notification System that will let you receive notifications should the food be dispensed, or when food storage levels have arrived at low levels. It is capable of storing up to 30 cups of food, where it can dispense as small as 1/8 of a cup. Just in case there is no power, a backup battery circuit will kick in and continue to dispense food according to your set schedule even without an internet connection. Apparently, should it raise $100,000 during the campaign, motion detection will be thrown into the mix, where the app will be able to notify the owner whenever the pet gets close to Nibbles. Should the $175,000 mark be reached, a second camera will be thrown into the mix so that you are able to check out whether your beloved pet has actually finished its food, now how about that? As a cat or dog lover, do you think that the Nibbles will be able to catch on in a big way?